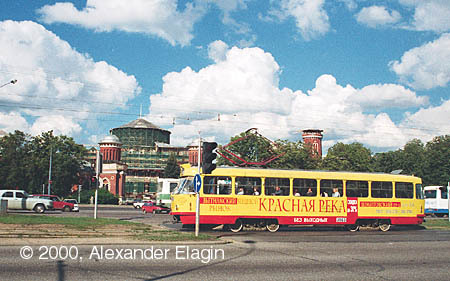 Leningradskiy Prospekt in the north-west of Moscow is a "patrimony" of tram route #23. Although this route was not the first and only to operate here, trams with a route designation 23 have been running along this broad avenue since the middle of 1930s. Of course, it is impossible today to get by tram from Leningradskiy Prospekt to Pushkin Square or Pokrovskie Vorota in the heart of the central Moscow - the tracks that led there are gone for many decades; it is also impossible to get to Presnya district - this link was closed in 2002 without reasonable replacement. 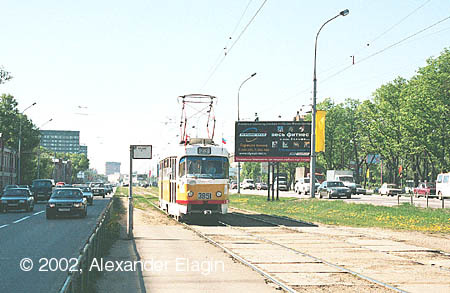 But trams are still present in the Prospekt and struggle for their existence threatened by inevitable reconstruction of this highly congested highway. Today the tram tracks come to Leningradskiy Prospekt near a large Petrovskiy Park and one of the greatest Moscow stadiums named Dinamo. This stadium was initially built in 1928 and, multiply modernized and widened, continues to be the one of the best Moscow sports complexes. As for the park where the stadium is located, it was laid out in 1827-1834 in place of old wastelands and puddles; it had become nice and rather fashionable in 19th century, although today it is slightly blight but still clean and safe. 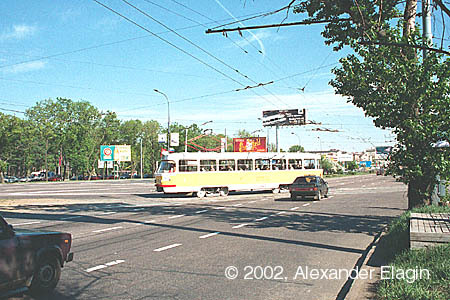 A curve that turns from 1st Botkinskiy Proyezd to Leningradskiy Prospekt is one of the two places in the Prospekt where tram tracks cross one of its motorcar traffic areas and come to their reserved lanes in the middle of the avenue. 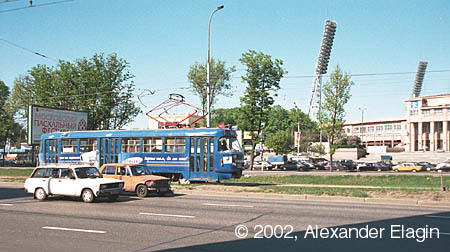 Multiple light masts ring in with the main arena of Dinamo stadium. A metro station with the same name is also located close to the stadium; it was opened for regular service in 1938. Tram stop Dinamo Metro station is located between two broad motorcar roads. Unfortunately, there is no pedestrian subway here, traditional traffic lights are used instead to let passengers cross the road. Petrovskiy Palace in Petrovskiy Park was built in in 1775-1782 by the famous russian architect Matvey Kazakov. This beautiful palace stylized after a castle with guard towers and gothic windows has been recently restored (the photo was taken just at the time of restoration). By the way, it is this palace where Napoleon lived in during his infamous Russian campain of 1812.